Saturday, May 10, 2003... Greetings from Barstow, California, along Route 66 halfway between Los Angeles and Las Vegas. No, I'm not driving Route 66 again...but I'm 100 miles from the road I'm actually driving. This year I'm driving a north-south loop along the West Coast: old US 99 north, US 101 south. I could've done it in one week, with few stops, sidetracks or diversions; instead I'm doing it in two, one now and one in August or September, with plenty of detours. On this trip I'm covering the Bay Area and south, with side trips to Death Valley, Sequoia and Yosemite National Parks and two Pizza Feeds sponsored by Baseball Prospectus, the Web site which publishes most of my essays on the business of baseball. I flew into Los Angeles last night after work. The first Pizza Feed, in Studio City, was held seventeen hours after I picked up my rental car at the airport. I drove there by way of San Diego, Calexico and Indio -- for Easterners, this is like driving from my apartment to my office by way of Scranton, Philadelphia and Wilmington, Delaware. Trying to remain on Eastern time as much as possible, I was on the road shortly after 6 AM Pacific time. The weather was just what I had left in New York, cooler than I had anticipated. As further reminders of home, I was accosted by a Jehovah's Witness at a rest area east of San Diego and approached by a squeegee man as I was taking the attached photo. All I needed was a Jew for Jesus handing out inane literature. Priority #1 was getting to the southern end of old US 99 as quickly as possible. 99 is the central backbone of the state, connecting every major city in the Central Valley, then entering the Los Angeles basin and turning sharply east-southeast. Old 99 ends at the Mexican border in Calexico, just north of Mexicali, Mexico. The road leading north from the old border crossing, recently signed as Historic US 99, dead-ends at a 10' fence marking the Mexican border. Two blocks away at the current crossing, the building closest to the customs station is a McDonald's. Old 99 then heads north across the Imperial Valley, long known for producing dates and citrus fruits. For some reason the El Centro Best Western is named for John Jay, complete with silhouette of an 18th century dignitary. Further north Brawley, a town of 22,000 people, sits over 100 feet below sea level. Then comes America's largest accidental geographic feature, the Salton Sea. In the spring of 1905, engineers opened a small gap in the banks of the Colorado River near Mexico, intending to divert some of the flow into irrigation canals serving the Imperial Valley. Oops: floods sent ALL of the Colorado River pouring through this new gap into the Salton Sink, an inland trough 200 feet below sea level. As workmen struggled for two years to close the gap, the trough continued collecting the drainage from 250,000 square miles of the Southwest. By the time the Colorado was returned to its banks, the Salton Sea had become California's largest lake, covering 450 square miles to a depth of 80 feet. About a third of the lake has since evaporated; the rest is a state recreation area. Old 99 catches up with Interstate 10 around Indio, the Date Capital of the United States. It passes north of Palm Springs, whose street names are a Hall of Fame of the entertainers of 60 years ago: Bob Hope, Dinah Shore, etc. 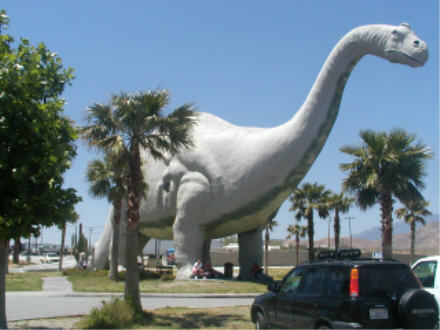 The dinosaur in the accompanying photo is one of two standing near Cabazon. They were originally carved in the parking lot of a truck stop, but the truck stop has since been replaced by a string of fast-food restaurants. Approaching San Bernardino, I turned north for a Route 66 attraction I had somehow missed the past few times: a combination McDonald''s/California Route 66 museum constructed on the site of the McDonald brothers' original restaurant. 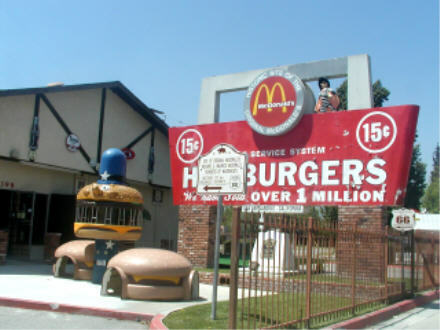 (After Ray Kroc bought the franchise rights but not the restaurant, he opened a competing McDonald's down the block and forced them to rename their original place "The Big M.") The museum displays a ton of early McDonald's artifacts collected from the locals, as well as a great set of historic highway signs from Route 66, many originally erected by the Auto Club of Southern California before the state got involved. Although much of old 99 around Los Angeles is now buried under Interstates, the original route north, San Fernando Valley Road, remains intact and drivable. If the shadows hadn't been so long, I would have driven it the length of the Valley; instead I settled for five or six miles through Glendale, the city where Charles Stengel, a would-be dentist and one-time outfielder, served as a director of the local bank in between managing the Yankees to 10 pennants in 12 seasons. The towns north of Los Angeles, colonized by the film and TV industry decades ago, seem far more livable than their counterparts to the south, with their flat terrain and block upon block of identical subdivisions. But the day's driving wasn't done. Although it's nowhere near 99, I had decided to add Death Valley to the itinerary. This will be my first visit since it was upgraded from a National Monument to a National Park. I've bought a cooler, seven pounds of ice and two gallons of water for the occasion. As a friend who's stayed at a motel in the park told me recently, the climate of Death Valley is so moisture-sapping that within seconds after he climbed out of a swimming pool, even his hair was totally dry. If I had more energy, right now I'd be out photographing the neon motel signs of Barstow to add to the "Signs of 66" gallery I recently added to my Web site. But since I got less than five hours' sleep last night and have already been up for 18 hours today, it's time for bed. Later!